Waterpik Reviews: Which Waterpik Should You Get? Why use a Waterpik anyway? I have decided to put together these Waterpik reviews because It is widely known that brushing alone does a poor job of cleaning between the teeth and I believe the Waterpik is a great tool for preventing decay and gum disease between teeth where your toothbrush can’t get to. The fact that in the past Waterpik only made comparisons with brushing alone rather than with brushing and flossing made me somewhat uncertain of how effective the waterpik actually is at cleaning between the teeth. Studies have recently been published comparing the Waterpik with string flossing. These studies show that the Waterpik is 50% more effective than string floss and can also clean areas of the teeth that neither your toothbrush or string floss can access. So now that the studies confirm what most people including myself intuitively felt would be a superior way to clean the teeth, I am now convinced of the superiority of water flossing compared with string flossing. So go ahead, throw away your cumbersome floss and switch to a Waterpik. Rest assured no matter which Waterpik you choose, you can expect quite similar and excellent results. In my opinion, the decision of which Waterpik you need mostly comes down to your budget, the space you have available in your bathroom, how many times you want to replace the water in the Waterpik reservoir during one cleaning session and how important it is to you that the unit is attractive and looks good in your bathroom. 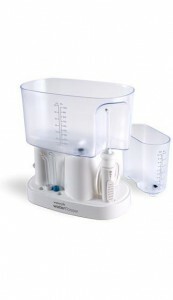 Some of the Waterpik units have four or more different types of tips to choose from. For example, there is a tip for cleaning around braces, one for cleaning around dental implants and other dental work, another tip for cleaning deep gum pockets if you have severe gum disease, and a regular tip for cleaning around normal teeth. Waterpiks have up to ten different water pressure settings while some only have two. The reason behind the different settings is that if you have very healthy teeth with no sensitivity problems, then you can go ahead and use a high pressure. However, if you have gum disease or sensitive teeth, you might need to use a lower setting. If you can afford it and you want to make sure you are doing the absolute best job of cleaning your teeth, I would recommend buying a Waterpik with as many different tips and water pressure settings as possible. That way you are more likely to find a combination of pressure settings and tip types that suit you best. Ok, so let’s review the different Waterpik models available along with my recommendations! Special compartment for holding waterpik tips and brush heads. You can’t go wrong with this device. You have all the options you need with ten water pressure settings and five tips as well as a sonic electric toothbrush. A benefit of having the sonic toothbrush included is you will save counter space and you will only need one power outlet instead of the two you would need if you buy a separate electric toothbrush. The toothbrush has a timer that ensures you brush for the required time in each quarter section of your mouth which means you don’t have to guess if you brushed each section of your mouth enough and you will lessen the chances of getting tooth sensitivity and gum wear from spending too much time brushing. I would recommend this Waterpik for everyone except children and those with deep periodontal pockets caused by advanced gum disease. 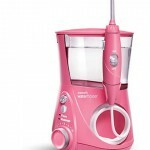 For children I would recommend the WP-260 Water Flosser For Kids. 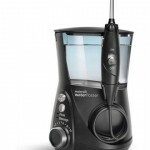 For someone with deep periodontal pockets I would recommend the WP-72 Waterpik® Classic Professional Water Flosser. 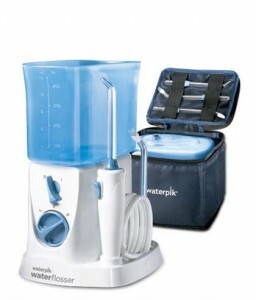 Click here to get your own WP-900 Waterpik® Complete Care at the best price. Most stylish model. 4 colors available, chrome finish and LED display. If you are style conscious and want a Waterpik that looks good in your bathroom, this is the Waterpik for you! It has a chrome finish, is available in 4 different colors and has an LED display. This Waterpik comes with the most tip options, seven. Probably more than you would realistically need, but if having many options is important to you then you will find this model appealing. There are two modes available unlike any of the other models. Floss mode removes maximum plaque and pulse mode “stimulates the gums” (I don’t really know what that means and sounds like marketing language rather than something of real benefit). The timer is a great idea. The timer alerts you when you have spent the required 30 seconds on your bottom and top teeth, 60 seconds total. If this model also came with a sonic electric toothbrush this would be the model I would recommend the most. If you already have an electric toothbrush you are happy with and two electric outlets in your bathroom, then I would consider this model over the complete care model. 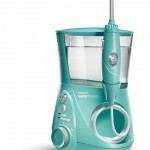 Click here to get your own Aquarius® Professional Designer Series Water Flosser at the best price. If you prefer the pink option click here. If you prefer the black option click here. If you prefer the teal option click here. Frankly, there is no difference between the WP-660 in this review and the WP-670 in the review above aside from the appearance of the machines. The 660 looks less stylish because it has no chrome finish or LED display and is only available in one color, white. If you don’t care about the color, chrome finish and LED display, save yourself $10 and get this model! Click here to get your own WP-660 Aquarius® Professional Water Flosser at the best price. Because this is the only Waterpik with a special reservoir for holding antimicrobial mouthwash and a special tip for cleaning under gum line, this is the best Waterpik available for someone with periodontal disease. The problem with this model is the water reservoir is not covered and it is quite large and takes up a lot of bench space. Bottom line if you have deep, hard to clean gum pockets this model is your best option. 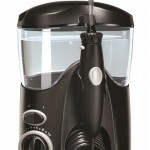 Click here to get your own WP-72 Waterpik® Classic Professional Water Flosser at the best price. There is nothing particularly exciting about this product. The main benefit is it is a bit cheaper than the Aquarius and does almost as good a job. It also comes in a choice of two colors. 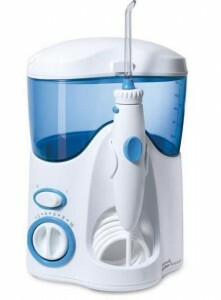 Click here to get your own WP-100 White Ultra Water Flosser at the best price. This is the obvious choice for children. Has a special tip designed to clean around orthodontic braces. The removable stickers will increase your child’s engagement and the likelihood of them actually cleaning between their teeth. 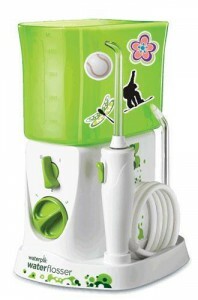 Click here to get the WP-260 Water Flosser For Kids at the best price. Nothing very exciting about this. Does the job for a reasonable price. Click here to get your own WP-60 Classic Water Flosser at the best price. This model is a great option if you are short of counter space and you also need an electric toothbrush. The 45 seconds of reservoir capacity means you will have to refill when moving from upper to lower teeth as it takes one minute total to do a proper job. 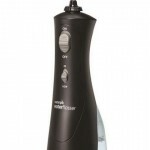 Click here to get your own WP-440 Cordless Professional Water Flosser at the best price. This model is pretty much the same as the 440 above. The only difference is it doesn’t come with an electric toothbrush, is available in black as well as white and is less expensive. Click here to get your own WP-450 White Cordless Plus Water Flosser at the best price. This is an ok option. You get what you pay for with this model. The 30 second reservoir means you may have to fill up twice in the one session and this model only has a one year warranty. 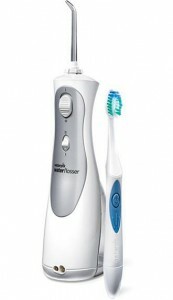 Click here to get your own WP-360 Cordless Water Flosser at the best price. If you like to clean your teeth in the shower this option is perfect for you! The showerpik works with most shower heads, but if it doesn’t work on yours you can get a special shower head from the Waterpik company. No chance of wetting your clothes! 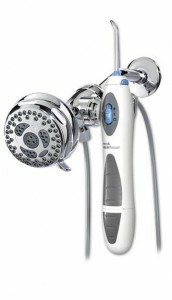 Click here to get your own WP-480 Waterpik® Showerpik® Water Flosser at the best price. This is a great option for those who travel internationally. It has global voltage compatibility which means it will work in most countries you travel to. It is also half the size of the other models and comes with a travel case so will easily fit in with your luggage. 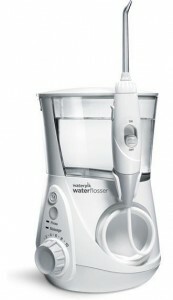 Click here to get your own WP-300 Traveler™ Water Flosser at the best price. I hope these reviews have helped you decide on which Waterpik model is best for you. If you have any questions on Waterpiks or would like to provide your own review please feel free to leave them in the comments section below. This entry was posted in Oral Hygiene, Product Reviews on October 31, 2015 by David. Lol “olfactory image”. I like that term. Can I borrow it? That’s great you have the motivation to string floss and water floss. It’s not surprising that you get a big improvement with your bad breath, when you consider there is about a golf ball sized area of tooth surface that your toothbrush can’t touch. Imagine all that foul smelling bacteria between the teeth multiplying. Thanks for the comment Daniell! Wow, I never realized all the advantages to Waterpiks and how much better they are than flossing. I also had no idea there were so many options to choose from. I gotta say they are a bit pricey but if they provide what you have described, I’d say they are definitely worth it. They seem to have pretty good guarantees though, so I wouldn’t worry about buying one for a while even if the one I bought would stop working for some reason. Great post! Thank you. I am glad you learned something about Waterpiks. Yes, they are pricey when compared with conventional floss. However, they do a better job and don’t require as much coordination as is needed with conventional floss. If you get one, I’m sure you won’t regret it. I had never heard of waterpiks before. You learn something new everyday! Would you recommend waterpiks for someone who doesn’t have any issues with their teeth or mouth yet or does a toothbrush suffice, David? Hi Matthew. Everybody should be cleaning between their teeth to prevent decay and gum disease and the Waterpik does this best. A toothbrush hardly cleans between the teeth at all because the bristles can’t get between the teeth. If you aren’t cleaning between your teeth, then you should start. I would highly recommend the Waterpik, but don’t feel that you absolutely need to get a Waterpik to clean between your teeth though. Conventional floss doesn’t do as good a job as the Waterpik, but it still does an acceptable job if you have the dexterity to use it. Hi Looks like you made a lot of effort giving the review , its detailed and really helpful. With so much choice on the market, and ever changing models, finding the best water flosser can be a real struggle. Does water flossing drive bacteria into pocket, damage the epithelium, or damage the periodontal ligament.? Hi Julie. What a great question! The Waterpik is totally safe at all power settings and doesn’t damage the periodontal ligament. The epithelium may bleed if you have gum disease but the bleeding will improve as your gum health improves from using the Waterpik. Let comfort guide you and use the highest setting that is confortable to remove as much plaque as possible. There have been no cases that I am aware of that the bacteria are driven into the pocket of the gum. If anything the Waterpik drives it out of the pocket! I am very impressed by your knowledge of dental anatomy by the way. This was an excellent article on how to choose the right water pick for your teeth brushing needs. I have always been unable to effectively floss my teeth due to lack of coordination. I cannot get my hands and fingers to get in there to do a good job. Every time I go to the dentist, they always rag on me for not flossing well enough. I have gum disease and would love to hear your recommendation on the best water pic for someone like me. I do not have dentures. I still have all of my teeth and I am told my teeth are in good shape, but my gums are needing help. What would you recommend? That’s great that gum disease is your only dental problem. Do you smoke? I ask because this is one of the main causes of gum disease. 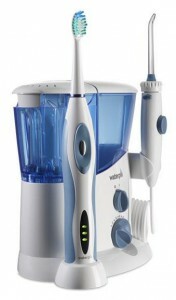 The Waterpik I recommend for people with gum disease is the WP-72 Waterpik Classic Professional Water Flosser. It is one of the cheaper models but is the best for gum disease because it has a special tip for cleaning under the gums and has a special reservoir where you can put your medicated mouthwash in to kill the bacteria deep inside the gum pockets. If you use that, I bet your dentist will be impressed at your next visit! Loving your Waterpik review! All these while I’ve been using traditional floss and I hated it because it was really uncomfortable for me, I didn’t know that you can just jet spray your teeth, that’s pretty cool. Just curious question though if you don’t mind me asking, will flossing clean mouth odor if you smoke? Definitely getting myself one of these, thanks for sharing this! 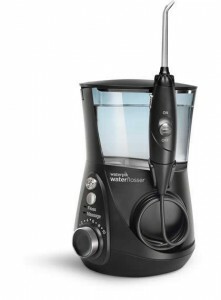 If you dont like flossing, then the Waterpik is a great tool and does a better job. The chemicals largely responsible for cigarette breath will be better removed by a Waterpik than floss. However they will still remain. Chewing xylitol gum can help a lot too as it stimulates saliva and helps further wash away these chemicals. I was completely unaware that flossing was so sub par in comparison to a Waterpik! I know what they are but never have even considered buying one. I guess that is where you come in. You provided great examples of different colors and different models which is really helpful for someone like me who has never even thought about using one. Maybe this is something that would help my 7 year old also. He may enjoy using the Waterpik so much that is would make brushing less of a chore. Glad you found the information useful. If you are going to get a Waterpik for your 7 year old I’d suggest the Water Flosser for Kids because it is easy to use and safe. The stickers they can use to customize their waterpik also increases their willingness to participate. I respect where your dentist is coming from. Your dentist may not be aware of new evidence though. I have only recently started recommending the Waterpik because until recently all their marketing compared the results of the Waterpik at cleaning between the teeth with brushing alone. I needed to see how the Waterpik compares with FLOSSING for cleaning between the teeth, not a toothbrush. After all, a toothbrush does a very poor job of cleaning between the teeth and that is why we floss in the first place! But now studies have come out that show Waterpik is indeed superior to floss at cleaning between teeth. 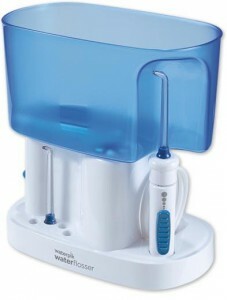 Not only that, but I see that my patients who use the Waterpik do have better oral health. So I have no hesitation recommending the Waterpik now. Especially when most people are just like you and hate to floss so don’t do it anyway! It’s your mouth, just use the Waterpik if you want to. If you want, do the following experiment. Clean between your teeth on one half of your mouth with floss and the other half with the Waterpik and see if your dentist can tell the difference! Great reviews on Waterpik units. Can’t believe I am only finding out about this technology now. Glad I did though! I think that this is something my little one will find much more interesting than flossing and could make it much easier to get her into the habit of doing. Will definitely be giving it a try. Kids definitely prefer the Waterpik for Kids tof flossing. Actually, so do most adults. I have met very few children who can floss properly as well, so a Waterpik is definitely a good option. 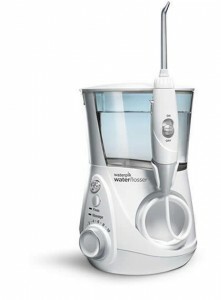 I have my semi-annual dentist appointment in two weeks and, thanks to your extensive reviews here, have now have begun to strongly consider ditching floss and investing in a Waterpik! I saw you mention the warranty of the devices above, but do you know about how long the product life is for a Waterpik? Hi Sebastian. Good question and I don’t really know, but I have a patient who has been using the same one for almost 10 years now. Of course, you have to replace the tips every 3 to 6 months. I always thought string flossing wasthe only way to go. I had heard of waterpiks before and thought “What good is a little water going to do?”. i am changing my mind after reading this post. I will be getting one. Your comparisons are really well done and thorough. I appreciate the Waterpik education I just got. I have a wisdom tooth that’s growing in a way that makes flossing and brushing inadequate. Then my daughter had her braces fixed and I get to use her waterpik. Amazingly, after diligently flossing and brushing I can still get food particles removed by waterpik. So, I got myself another one for my own personal use! I see you recommend WP-72 for someone with Gum Disease due to the special reservoir for holding antimicrobial mouthwash. Could I use another if just as good if I fill it with a mixture of water and mouthwash?